Sunday’s matchup between the Colts and Rams will hold a special significance for linebacker Josh McNary. 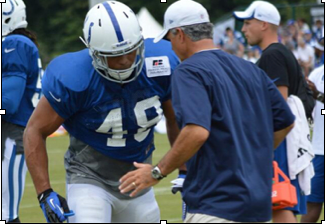 For the past few months, McNary has been a member of the Colts practice squad in his first season in the NFL. McNary is a 25-year old rookie who previous spent the last three seasons fulfilling his commitment to the Army. While McNary won’t be on the playing field on Sunday afternoon, he will watch with pride as the Colts take part in the NFL Military Appreciation month of November. “It’s real cool for an entity like the NFL because it’s not their responsibility to look out for the military but just out of their respect they decided to go way out of their way to honor the military,” McNary says of Sunday’s game. The past few months has allowed McNary to get back to the game of football. During a regional combine in Dallas earlier this year, the Colts scouted McNary and the former all-time sack leader at Army has since stuck on with the team’s practice squad. McNary has made the move to inside linebacker and now that he’s fully recovered from a training camp hamstring injury, the West Point product loves life in the NFL. A numbers crunch at Army forced McNary to switch to the outside linebacker position, where he flourished with 49 tackles for loss and 28 sacks. Prior to 2013, McNary had been removed from the game of football for three years but on Sunday he will get to watch his past and present combine.